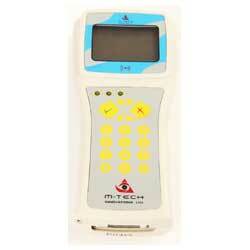 M-Tech Innovations, the preferred Indian smart cards manufacturer presents multipurpose hand held reader solution - MTUHF. This multiport reader is compatible with many protocols, different types of designs. The device connects with the help of 4 antennas and has the ability of fast reading, multi tag identification; it is known as Industry protection grade device. Our flawless device proves our recognition of being one of the leading smartcard manufacturers from India. This reader has special anti collision algorithm with high efficient multi tag identity capability. This handheld reader is multipurpose and can be used for Logistic Tracking, Person Tracking systems and Vehicle Tracking Systems. Enhances product quality with improved automation of process and materials visibility. Better security of assets and workers with real-time location information. Maximizes asset lifecycle along with improved asset utilization.